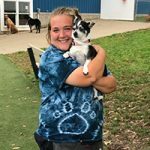 At Lucky Paws Pet Resort, we are proud to say that our staff is made up of people who love their pets and will care for your pet like their own! 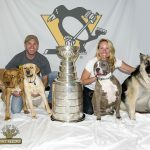 Check out our team with their furry family members! Owners of Lucky Paws. Gretchen and her husband Jason purchased Lucky Paws on January 7, 2014, after cashing out her 401K. 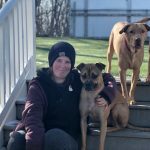 It was a big change for Gretchen as she left the Western PA Humane Society after almost 12 years to take the leap into entrepreneurship. It has been a labor of love ever since. Gretchen is here in some capacity almost every day. The staff and dogs are her pride and joy, but the Gardens at Lucky Paws are very near and dear to her heart. Jason has a job in the computer/tech industry but is thankfully very handy at fixing things that need repaired, as well as shoveling snow and mowing grass. Be sure to say hi! I was hired as the Hotel Manager in 2012 and was promoted to General Manager in 2014. I worked as a vet tech for many years working along side Dr. Strobel at Gardens Veterinary Hospital. I have 2 grandkids who I spend as much time with as I can. They are my world. I adopted my two dogs from a former client who was unable to keep them. They are fat and happy dogs. 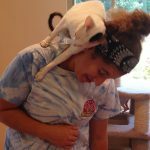 My favorite part of working at Lucky Paws is that I’m able to be a part of all aspects of the business. HSN and QVC are my favorite pass times, second to my Grandkids. Whether playing with puppies or graduating therapy dogs, I have the best job! 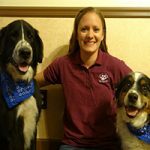 I am a trainer at Lucky Paws helping dogs exceed their potential. On my days off, I am on adventures with my husband, two amazing sons, and two great dogs. 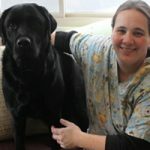 I started at Lucky Paws in 2010 as a part-time tech while in College for pre-vet. I love to spend my down time watching Turner Classic Network and my favorite TV show is Murder She Wrote. I grew up on a cattle farm, and still spend time working with my family there. 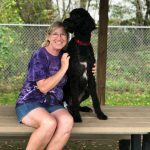 I have been working at Lucky Paws since 2011. There hasn’t been a part of Lucky Paws that I haven’t worked in. There are many dogs that I’ve watched grow from tiny puppies into sweet senior citizens. 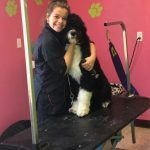 I was happily given the opportunity in 2014 to begin my grooming career and have enjoyed having the one-on-one time with the pets, as well as the relationships that I do with the families. I have 3 kids and a black Labrador, Reggie who mean everything to me. I’m thankful every day for having a job that I love. I have my degree in Veterinary Technology and worked with Dr. Lill for 9-years at Cranberry Veterinary Hospital until his retirement in 2013. 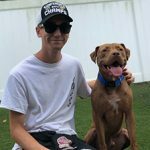 I’ve worked at Lucky Paws for 5 years, starting as a part time tech, and have been the Daycare Manager for a little over 2 years now. I have 2 dogs. Foxy is my 13-year old black lab. She came to live with me straight from school, where she was one of the dogs we cared for during our training. Lago is my 7-year old 3-legged Cane Corso. He’s a cancer survivor and my best friend. In my spare time I love to read books and watch sports. When I decided on a complete (!) career change, Lucky Paws was where I wanted to be. I enjoy working with such different and unique people and their pets. One of the best things about my job is that if I’m having an off day, I can simply walk into the hotel and get all the hugs & kisses I need to feel better. I am an avid reader and if I’m not spending time with family or friends, I’m usually snuggled up reading a good book. 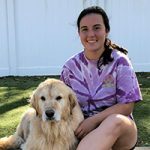 Kaitlyn says “I have been at Lucky Paws since 2016. I am lucky enough to work in the hotel and daycare so I get to meet almost all of the dogs and cats in our care. My favorite part is spending time with the dogs and getting to see the grow from puppies to adults to seniors. I have 2 dogs of my own – Simba and Molly. Molly loves coming to daycare with me. 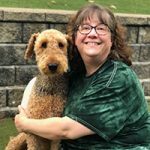 Listening to how much my mom Michele enjoys working at Lucky Paws made me want to be a part of the team. I started working part-time in November 2017, and am now working full-time as a Senior Tech. One of my dogs is a rescue. When he came to live with us he was severely underweight, filled with fleas and not social at all. Since he’s been with us, he’s gained the weight he needed to gain, the fleas are gone, and he’s slowly making progress with his social skills. I think we both rescued each other. I am fortunate to have a job working with dogs! I have 2 Golden Retrievers that are loving and constant companions. My favorite vacation is the beach and I am a committed vegetarian. I’ve been around animals my entire life but my passion is both raising and riding my horses. I have a 125 lb. Newfoundland “puppy” named Sarge. We spend a lot of time hiking and being outdoors. My favorite thing about working at Lucky Paws is how happy the dogs get when they see me. My name is Ali. After high school, I went to grooming school. After graduating, I received my grooming license and have been grooming professionally since 2017. In my free time I love to paint and spend time with my friends. Copyright © Lucky Paws Pet Resort. All Rights Reserved. Web Design by Higher Images.